This page includes links to information and resources for consumers and engaged residents who are interested in buying local food products or otherwise developing their community or local food system. N.C. Fresh Produce Safety Portal provides information to consumers concerning foodborne illnesses and educational resources.This includes information on health and wellness, educational resources and foodborne illness. The NC State Extension Food Safety Portal provides information to consumers on food safety for food preservation, gardening, farmers markets and more. Pledge to buy 10% of your food locally – Join the NC 10% Campaign – a Center for Environmental Farming Systems (CEFS) program to encourage consumers to commit 10 percent of their existing food dollars to support local food producers, related businesses and communities. Statewide and Regional Training and Events can be found on the Local Food Web Portal Events Page. 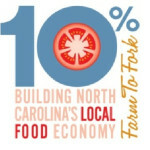 County-based local foods events, tours, and fairs on the NC 10% Campaign Events Page.